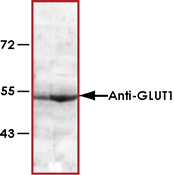 Sample Data :Western blot analysis of heart and muscle lysates with Anti-GLUT1 antibody. Scientific Background :GLUT1 is a gene which encodes a major glucose transporter in the mammalian blood-brain barrier. Mutations in this gene have been found in a family with paroxysmal exertion-induced dyskinesia. 1. Makni,K., Mnif,F., Boudawara,M., et al. Association of glucose transporter 1 polymorphisms with type 2 diabetes in the Tunisian population. Diabetes Metab. Res. Rev. 24 (7), 544-548. 2008.